Michael Fred Phelps II is known principally as the most decorated Olympian of all time, with a total of 28 Olympic medals, 23 of them gold, spanning over four Olympic Games. He has actually competed at five Olympics; however, he did not medal at his first Games in Sydney, Australia. He is recognized for his formidable butterfly, though he also specializes in individual medleys and the 100 and 200-meter freestyle. At 31-years-old, Phelps retired from swimming as the greatest of all-time. His retirement came just days after finishing his fifth Olympics with five golds and a silver medal. 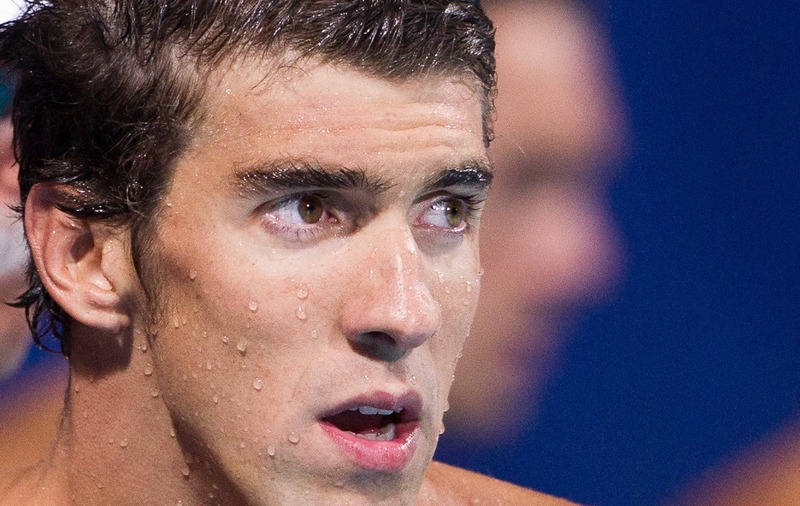 Michael Phelps was born in Towson, Maryland on June 30, 1985 to Fred and Debbie Phelps. While following in the wake of his two older sisters, Whitney and Hilary, a young Phelps was initially fearful of putting his face in the water. However, he overcame this discomfort and, in 1996, was inspired by the performances of Tom Malchow and Tom Dolan during the Olympic Games in Atlanta, Georgia. Shortly thereafter, he joined the North Baltimore Athletic Club, where he met Bob Bowman, the coach who would see him through the highs and lows of the rest of his career. Though Phelps struggled in school and was diagnosed with ADHD, he focused most when it came to swimming. In 2000, Phelps found himself in Sydney, Australia, having qualified in the 200-meter butterfly. At 15, he was the youngest male Olympian the United States had presented in nearly 70 years. While he did not medal at the meet, he competed in the finals against Tom Malchow, touching fifth. As a spectator at the event, Phelps gained another source of inspiration from observing the races of a bodysuit-clad freestyle legend, Australian Ian Thorpe. 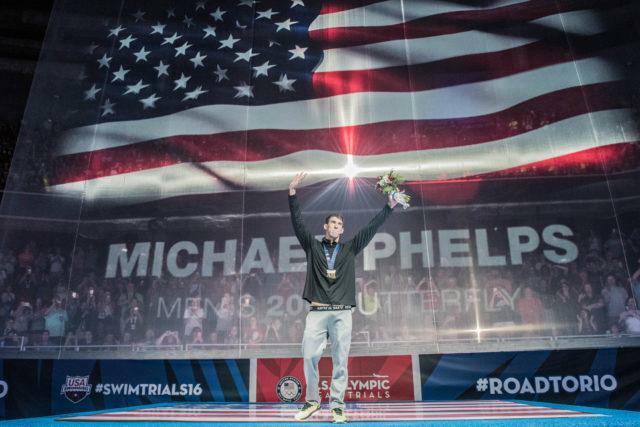 The next year, during World Championship Trials at the Phillips 66 Nationals, Phelps broke his first world record in the same event in which he had competed at the Sydney Games, the 200-meter fly. Still 15, he also became the youngest male swimmer to break a WR – a title previously held by none other than Ian Thorpe, who had broken the 400-meter freestyle WR at 16 years and 10 months of age. Phelps went on to the 2001 World Championships in Fukuoka, Japan, where he broke his record again, and solidified a tight grip on the 200-meter butterfly that would not be fully relinquished until his retirement. In the following years, Phelps built his repertoire, proving himself on multiple occasions as not only a butterfly guru, but also a freestyle, backstroke, and I.M. expert, focusing on the shorter end of middle distance swimming. At the Athens Olympic Games in 2004, he earned six gold and two bronze medals. On the first day of the meet, Phelps won one of the most grueling events, the 400 meter I.M., in record time. During the highly anticipated 200-meter freestyle race, Phelps swam against his hero, Ian Thorpe. Phelps medaled third, behind Thorpe and Pieter van den Hoogenband. He was 19 years-old. During the period between the 2004 and 2008 Olympics, Phelps amassed a number of world records, thoroughly displacing Ian Thorpe as the nucleus of the swimming universe. Though he was arrested for driving under the influence in November after Athens, for which he served 18 months’ probation, paid a fine, and did community service, Phelps later apologized for the mishap and continued on to medal six times at the 2005 World Championships in Montreal. In 2007, he acknowledged his plans to beat the record of most first place finishes in a single Olympics, then held by Mark Spitz, who won seven gold medals in the 1972 Munich Games. 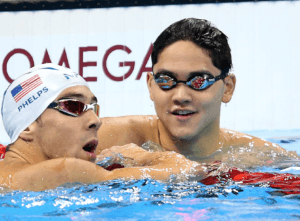 While Phelps could have done so in 2004, those plans were derailed by Thorpe and van den Hoogenband in the 200 free, and again by the loss of the 4×100 free relay, for which Phelps swam the preliminary heat. In preparation for the challenge, Phelps competed in eight events at the 2007 World Championships. The 4×100 medley relay team was disqualified, and did not compete in the final. However, Phelps won his seven other events, five of them in world record time. In the months leading up to the 2008 Beijing Olympic Games, neither Mark Spitz nor Ian Thorpe expressed support or belief in their would-be protégé. Phelps proved them wrong, blasting competition out of the water eight times in a row, including two relay events, during which he relied heavily on the attitude and preparedness of his teammates. He also beat Serbian Milorad Čavić in the 100 fly by 0.01 seconds. The athletes touched so close that the final result required scrutiny of the playback video, and caused a wild controversy in the swimming world. 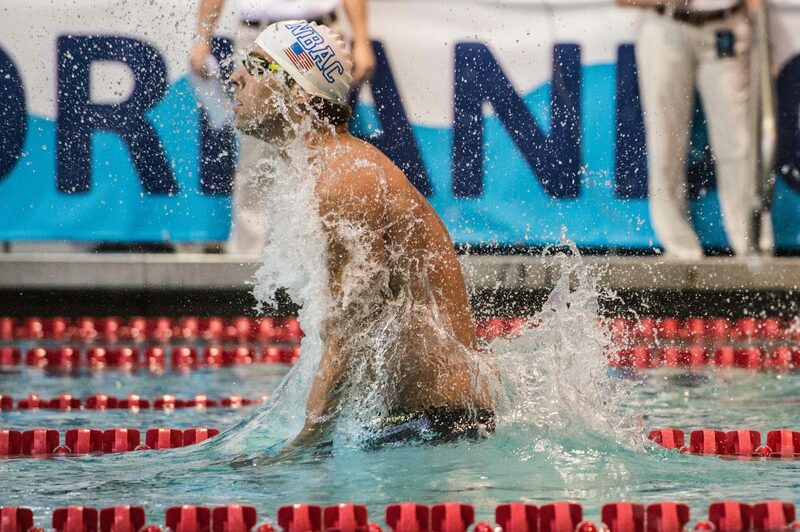 In the end, it was determined that the Omega Timers registered Phelps’ powerful touch first, rather than Čavić’s light glide, and Čavić challenged Phelps to a rematch of sorts in 2009. Thus, eight of his 18 gold medals were won at the 2008 Beijing Olympics, where Phelps took Spitz’s record. While the fame and awe lasted a while, it also called attention to Phelps’ recreational drug use, which was addressed publicly when a picture of him using a bong surfaced on the Internet in February 2009. He responded much like he had four years previously to the DUI – he apologized and did his time: three months suspension from USA Swimming. At the 2009 World Championships in Rome, facing rumors that he was out of shape and out of mind, Phelps lost his first race in four years to relative newcomer, Paul Biedermann, which prompted controversy regarding the potential unfair advantage Biedermann might have gained from his full polyurethane suit, the Arena X-Glide. Phelps, who wore a Speedo LZR racer, graciously acknowledged Biedermann’s accomplishment as a result of his training, not his gear, though Bowman begged to differ. Phelps went on to beat Čavić in the 100-meter butterfly for a second time. Čavić wore an X-Glide, and, upon his triumph, Phelps pumped his chest and pointed at the Speedo insignia emblazoned on his suit. Despite controversy and public doubt, Phelps returned from Rome with a total of six international meet medals. After the 2009 World Championships, full-body, textile suits were banned by FINA, and Phelps’ world record streak slowed. His motivation began to waver, which showed in his performance during off-season meets. He had long since stated that he did not want to swim past the age of 30, and that the 2012 Olympics Games would be his last. With help from his mother, from a friend on the Baltimore Ravens football team, and from the ever-persistent Coach Bowman, Phelps pushed aside his reluctance, just as 7 year-old Phelps did twenty years before when he overcame the fear of submerging his face. He used the 2011 World Championships in Shanghai to bolster his confidence and prime his skills. Two silver medals earned behind underdog Ryan Lochte, and third place in the 4 x 100 freestyle relay caused concern. However, Phelps also gathered four gold medals, including his fifth 200-meter butterfly championship, and steadied his focus on London. Phelps’ goal for his last Games was to become the most decorated Olympian of all time – no small feat, even if it did not require solely first place finishes. His first event, the 400 I.M., which he once vowed never to swim again, was a major disappointment. He did not medal, touching fourth, while longtime rival and friend, Ryan Lochte, rejoiced in first. Despite this, Phelps finished out the meet with another six medals, for a total of 22 Olympic medals – three more than the number held by Russian gymnast Larissa Latynina. Latynina joined him in a Louis Vuitton fashion shoot that was released shortly after the Olympics ended. Phelps then retired, having collected a total of 71 medals in major long-course competition. At that point he held six long-course world records, including that of his signature event, the 200 fly. During his quasi-retirement, Phelps focused on the Michael Phelps Foundation, which he founded with Bowman after his success in Beijing. He continues to support youth interest in the sport of swimming and promotes the importance of a healthy lifestyle. For a time, he traveled around the world attending golf competitions, and was even on a golfing television show. But he never strayed too far from swimming – making an appearance in the stands at the 2013 World Championships in Barcelona, and joining his old training crew at the NBAC to stay in shape, stirring fans into a frenzy at the possibility of a return to competition. Even rival Ryan Lochte stated in multiple interviews that he knew Phelps would be back. Leading up to and after 2013 Worlds, Phelps hosted fellow Olympian, Conor Dwyer, who has been training with Bob Bowman. Phelps accompanied the NBAC to the Minneapolis Grand Prix in November 2013, which was held the same weekend that his re-entry to the drug testing program was publicized in U.S. Anti-Doping Agency quarterly reports. Though he had not swum competitively since the summer of 2012, Phelps reentered the U.S. drug testing pool in the early fall of 2013, though this was not made public until November. Phelps stated that “nothing is set in stone,” but many saw this as the first step toward the 2016 Rio Olympic Games. In January 2014, Phelps joined the NBAC on their winter training trip, appearing on teammates’ social media as merely a spectator enjoying the beach. 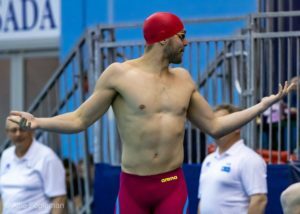 In late March, Bowman entertained hypothetical questions regarding Phelps’ fitness in correlation with upcoming meets, but it wasn’t until April that Phelps resurfaced. 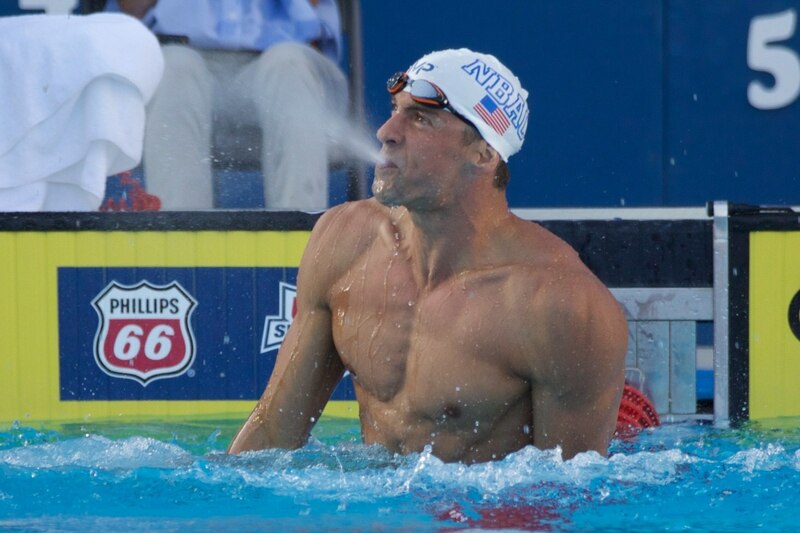 Phelps returned to competition at the Arena Grand Prix in Mesa, AZ on April 24th. His first race was the 100-meter butterfly, an event in which he holds the world record. He seeded into finals first, with Ryan Lochte coming off a knee injury at his side. Though Lochte prevailed in the final, Phelps was a close second and participated in the post-race interview, telling fans that he was just having fun, and joking with his rival about being behind at the wall. 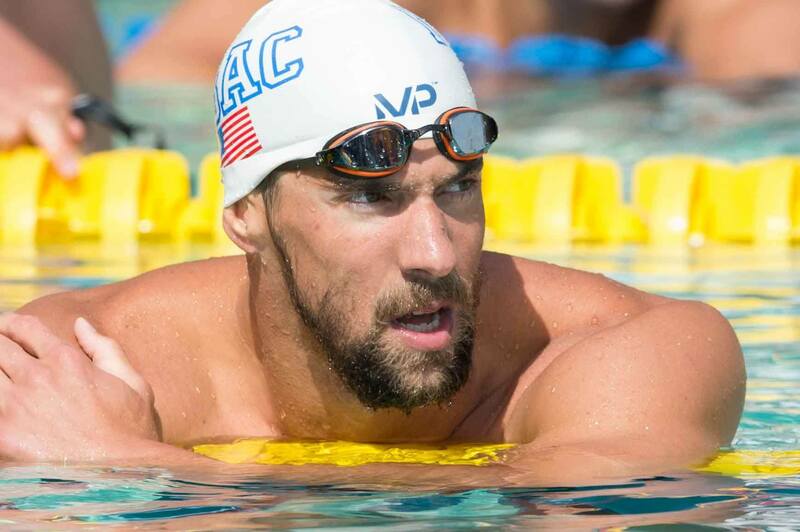 After successful appearances at the Arena Grand Prix in Charlotte and the Bulldog Grand Slam in Athens, Georgia, Phelps’ performance at Phillips 66 Nationals in August left something to be desired. He came in seventh in his first event, the 100-meter freestyle, only medalling in the 100-fly and 200 individual medley – both silver. However, second place finishes were all he needed to secure a spot at Pan Pacific Championships later that month. His Speedo sponsorship over, Phelps signed a multi-year contract with AquaSphere in August. 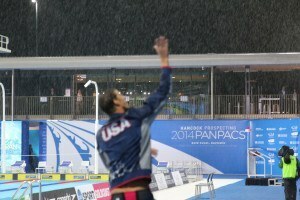 Phelps fared better in the international spotlight, collecting five medals despite the rain in Gold Coast, Australia. He reclaimed his hold on the 100-fly, helped both the 4 x 200 free relay and the 400-medley relay to victory, and took second in the 200 individual medley and 4 x 100 free relay. He remarked that he and Bowman had begun looking ahead at long-term goals, mentioning the 2015 World Championships. Phelps was back. The triumphant return suffered a jarring interruption in the fall, when Phelps faced his second DUI arrest in Baltimore. Within a week of the incident, Phelps issued a statement over Facebook in which he briefly discussed his decision to attend a treatment program in order to “make better decisions in the future.” USA Swimming banned him from competition for six months, and from competition at World Championships in 2015. Upon his return from the program in December, Phelps appeared in court, where he pled guilty to driving under the influence. He avoided jail time, but is undergoing 18 months of supervised probation and cannot drink during that period. Meanwhile, he has returned to training. His suspension will be lifted in the spring, and he still has over a year to prepare for Rio. 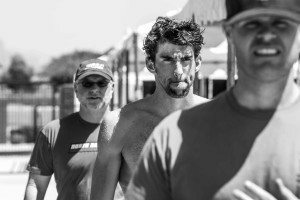 At the heart of it, Phelps is a swimmer, 2015 is a starting block, and he knows it’s time to step up. 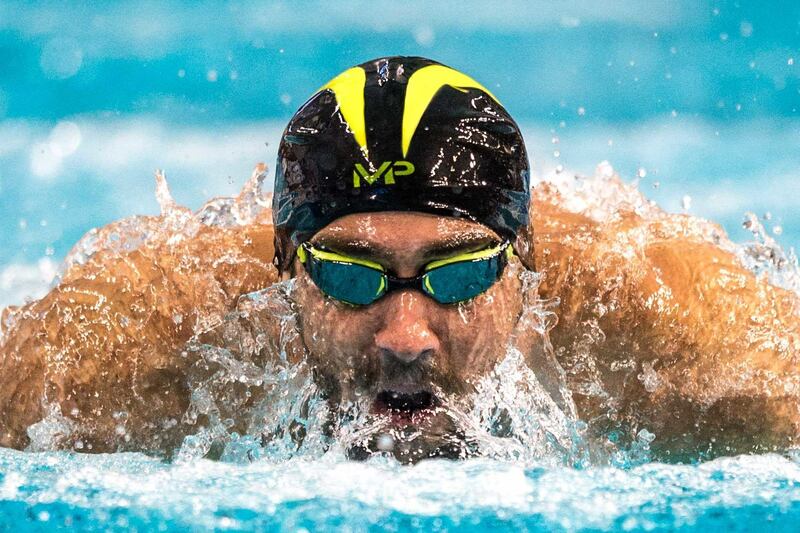 Michael Phelps and Aqua Sphere officially launch the “MP” brand with the release of their highly anticipated technical swim suit XPRESSO, April 15, 2015. 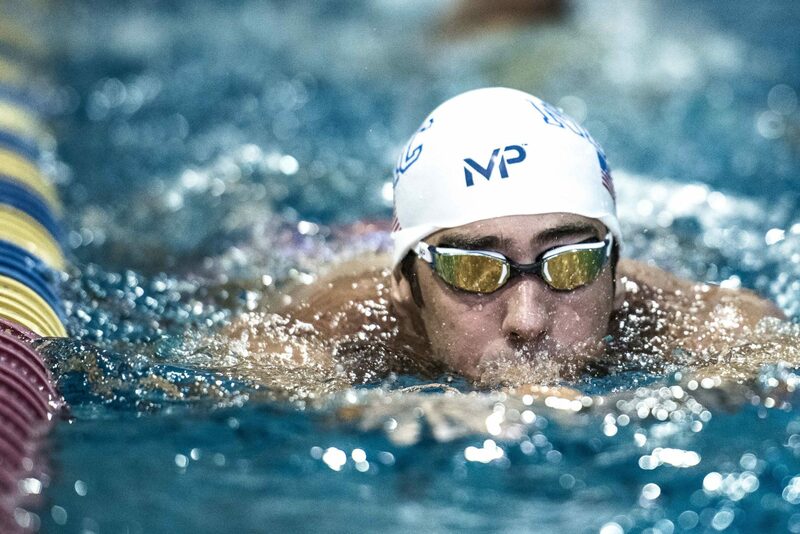 The MP line, developed with the technical input and product testing of Phelps and Coach Bob Bowman, includes performance swim goggles, K180 and K180+, and competitive training Focus Swim Snorkel designed and manufactured by Aqua Sphere. The Phelps-Aqua Sphere collaboration is unique in one very important way. It is arguably a first in the competitive swimming market. While there have been signature lines of products carrying a swimmer’s name in the past, they were limited runs. MP is different. MP, the entire business model, is more akin to Nike and famous basketball star Michael Jordan’s iconic brand Air Jordan. After being suspended from the 2015 FINA World Championships due to his second DUI, Phelps competed at the U.S. National Championships in the same time period. Held in an outdoor pool in San Antonio, Phelps posted times that are some of the closest marks to both the super suit era and the London Olympics. Phelps focused on three major events at Nationals — the 100-meter fly, 200-meter fly and the 200-meter IM. He also showcased the 200-meter breast, an event he swam for fun, but still managed to qualify for the championship final. He went three-for-three — in the 200-meter IM, Phelps managed to win a national title and top the world’s fastest time, faster than the time posted at the World Championships. 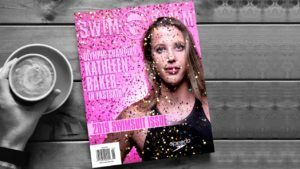 Shortly after the 2015 U.S Nationals, SwimSwam premiered its first issue of SwimSwam magazine. 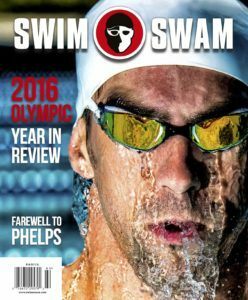 The flagship issue took a look back on the 2015 year in swimming and featured Phelps on the cover for his illustrious performances. The cover article described the anticipation in the air to see Phelp’s first race at the U.S. nationals and the uncertainty that fans had about whether the G.O.A.T. was going to be back to his peak form or not. The cover shot was captured by Mike Lewis. Michael Phelps swam 1:54.84 to win the 200 fly and secure a spot on his fifth Olympic team. 384 athletes in history have made five Olympic teams, a list including only 14 swimmers. Two of those swimmers, Derya Büyükuncu of Turkey and Lars Frolander of Sweden have participated in six consecutive Summer Olympic Games. Phelps is the first American male swimmer to accomplish the feat, and matches the legendary Dara Torres, who also made 5 teams, as the only Americans to do so. The Rio de Janeiro Olympic Games were Phelps’s fifth consecutive Games, the first being the 2000 Sydney Olympics, where the fifteen-year-old who had yet to become the greatest of all time finished fifth in the 200 fly (1:56.50). After being awarded his gold medal by 1992 200m butterfly Olympic gold medallist Mel Stewart, and being interviewed by Brendan Hansen and Kaitlin Sandeno, Phelps ran to the stands on the other side of the pool. 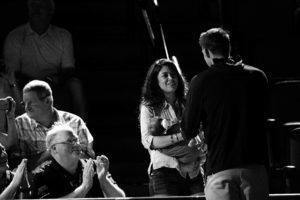 Spotlight on Phelps, his fiancée Nicole Johnson walked down the stairs to him with their newborn child, Boomer Phelps. He kissed her, he kissed his child, he handed them the flowers and stuffed animal he received along with his gold medal, and then jogged out of the pool giving high-five to excited swim fans on the way out. The final time Phelps and Ryan Lochte raced on U.S soil did not disappoint the fans in Omaha. Phelps joked that Lochte gave him a “flat tire” as they walked to the blocks, but by the time they stood up, the friends became rivals again. Phelps lead from start to finish, but Lochte was hot on his heels the whole way. The pair went 1-2, the same order they have for last three Olympic Trials. In true Phelps fashion, he went three for three in his events in Omaha. In the 100 meter butterfly, the event that always gets Phelps fans’ hearts racing, he took to the pool in lane 7 for the final. At the turn he was outside the medals in 4th, but his experience and endurance showed for the final 50. He came back in under 27 seconds to take the gold and his third individual event for the Olympics. 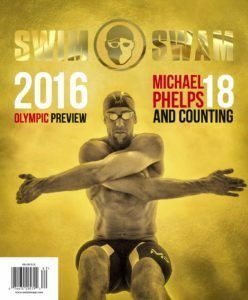 For SwimSwam Magazine‘s Olympic preview issue, Phelps once again graced the cover, this time all in gold and sporting his famous pre-race arm flap. The issue chronicled the potential of this Games for many athletes, including Phelps’ legacy and how much he could add to it. 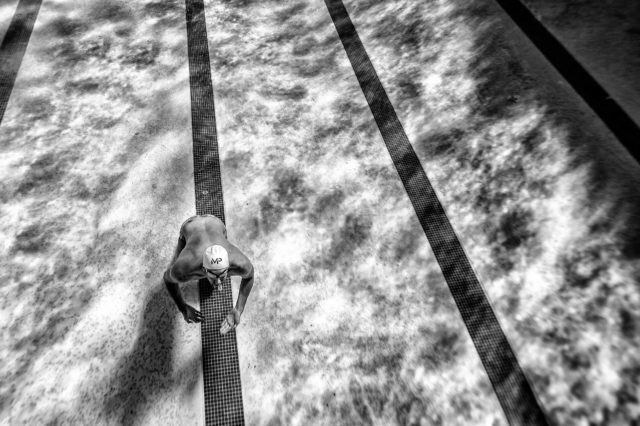 The cover shot was captured by Mike Lewis, shortly before Phelps made his last Olympic run. Olympic medal number 23 came in Phelps’ first event in Rio, 4×100 meter freestyle, and it was his 19th gold. Phelps took over for the second leg from Caeleb Dressel in second place just behind France. By the time he finished his leg, Team USA were over a second ahead. Ryan Held and Nathan Adrian maintained the lead for the rest of the way to take gold in 3.09.92. Phelps’ split of 47.12 was the fourth fastest of all the swimmers. 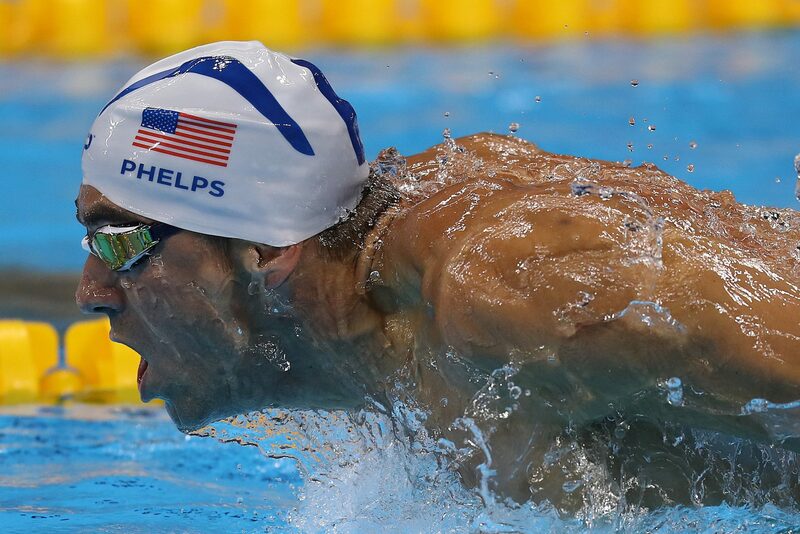 Phelps looked to reclaim his 200 meter butterfly crown, up against 2012 champion Chad Le clos. At the halfway mark he started pulling away, turning in 53.35, just ahead of Chad le Clos. As the final 50 unfolded it was experience against youth as Phelps fought to hold on while le Clos slightly dropped back. Hungary’s 19 year old Tamas Kenderesi and Japan’s Masato Sakai made their come back but didn’t have enough to take Phelps’ crown. Sakai took the silver and Kenderesi, the bronze. Phelps won his 20th gold medal as he took back his crown winning the 200 meter butterfly in 1:53.36. It didn’t take long for Phelps to add to his medal tally again. An hour after his gold medal swim in the 200 meter butterfly, he was back on the blocks in the 800 meter freestyle relay. Conor Dwyer, Townley Haas and Ryan Locte gave Phelps a three second head start on the rest on the field as he took over for the anchor leg. James Guy of Great Britain made a move, but you can never bet against Phelps. He maintained the lead to give Team USA the gold and Phelps his third of the games. Phelps dived into the history books again, becoming the first swimmer in history to win an Olympic gold in the same event in four consecutive games, claiming gold in the 200 meter medley. His 22nd Olympic gold came in style as he streaked ahead in the final lap to destroy the field by two seconds. It looked to be another epic battle between Phelps and Lochte as the pair along with Brazilian Thiago Pereira switched off the lead in the opening stages. At the halfway mark, there was just 0.01 splitting first from third with Lochte having the slight advantage. But Phelps took control on the breaststroke leg and left the rest of the field behind. He touched for gold in 1:54.66 while both Lochte and Pereira dropped off, only managing 5th and 7th. Japan’s Kosuke Hagino and China’s Shun Wang rounded off the medals. It wasn’t meant to be for Phelps in the 100 meter butterfly, as 21-year-old Joseph Schooling of Singapore denied him of his 23rd Olympic gold, breaking Phelps’ Olympic record in the process. Phelps turned at the halfway mark in 6th, but as always, his final 50 he turned on the burners. In another Olympic first for Phelps, he touched in a three-way tie for second with long time butterfly rivals, Laszlo Cseh and Chad le Clos. The three finished 0.75 seconds behind Schooling in 51.14. He concluded his fifth and final Olympics in true Phelps fashion, stood on top of the podium. 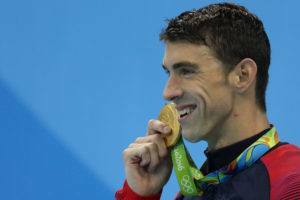 His 23rd gold medal came in the 400 meter medley relay, with Phelps on the butterfly leg. Ryan Murphy got Team USA out to a flying start, breaking the World Record on the backstroke leg. 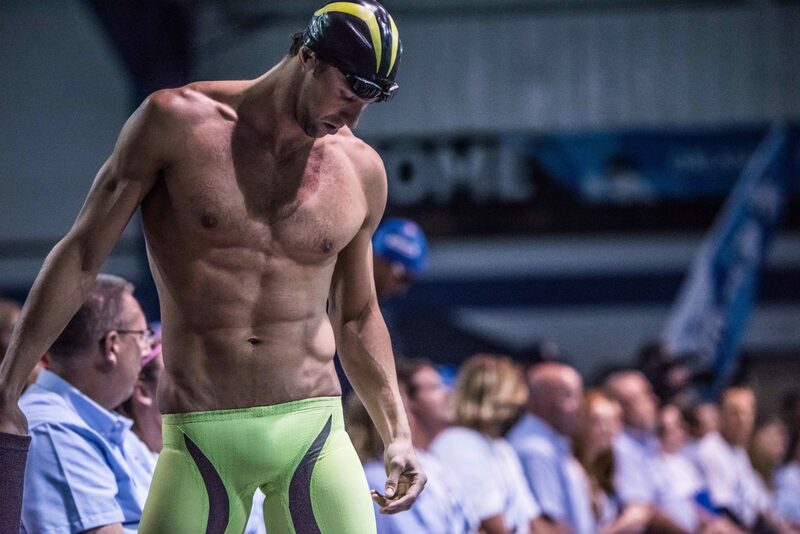 After Cody Miller on the breaststroke leg, Phelps took over in second behind Great Britain. Phelps got back out in front to give Nathan Adrian a head start to bring it home. Team USA won the final gold of swimming in 3:27.95, a new Olympic Record. Two days after wrapping up his fifth Olympic Games, Phelps announced on The Today Show that he was retiring, saying “this time I mean it,” referring to his last retirement after London 2012, which of course did not last. 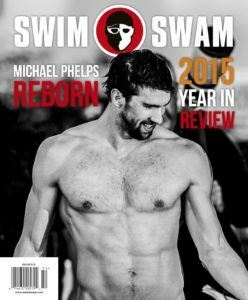 At the end of 2016, Phelps made his way onto his 3rd cover of SwimSwam Magazine, again being the highlight of a historic year in swimming. The magazine goes in depth on what Phelps’ accomplishments in the pool meant, not only in reference to gaining 6 more Olympic medals, but to his entire career, and what mark he will leave with the sport of swimming. The cover shot was captured by Mike Lewis. 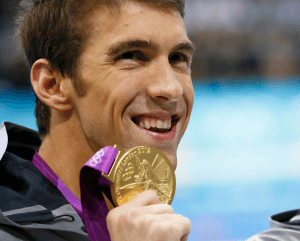 Over the years, Phelps has won a variety of accolades recognizing his hard work and dedication to swimming, including several Espys and Sportsman of the Year in Sports Illustrated. In the media, Phelps was featured on the Haney Project, a competitive golfing show, and guest-starred as himself in an episode of USA Network’s show, Suits, of which he and Conor Dwyer are avid fans. He has also written several books, the most prominent of which is No Limits: The Will to Succeed.